The North Korean government prohibits citizens from choosing any haircut they wish – instead limiting them to 28 state-approved haircuts. 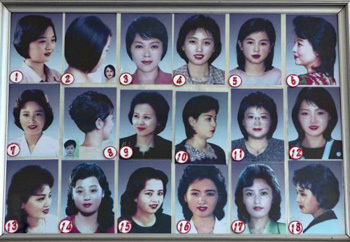 Images from a hair salon inside the notoriously secretive country show a menu of 28 state sanctioned styles – 18 for women and 10 for men. The North Korean government thinks these styles are “most comfortable” and able to guard against the “corrupting effects of capitalism,” according to wantchinatimes.com, an English website run by the China Times News Group. All steer far away from any shocking examples of Western decadence. Mullet? No way. Mohawk? Don’t even think about it. Faux hawk? Leave it to Beckham. Married women are allowed more leeway in their hair choices than single woman. The situation for men is a bit more dire. Young men’s hair must be less than 2 inches long. They’re required to visit the barber every 15 days. The government believes that long hair draws nutrition away from the brain. Older men are allowed to grow their hair up to 2.8 inches. Spiky hair is vigorously banned. It is unclear what choices are available to balding men or babies. This isn’t the first time North Korea has launched an all-out assault on flamboyant hair. 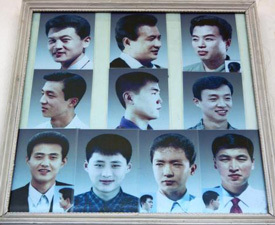 In 2005, Pyongyang televison aired a series entitled “Let us trim our hair in accordance with socialist lifestyle,” urging North Korean men to clean up any shaggy dos. Dictator Kim Jong-un, a.k.a. the sexiest man alive, seems to have found a middle ground. But his trademark half-buzz, half-mop might be hard to replicate. The legislation moved swiftly through Parliament, passing in both houses in two months despite fierce resistance from the world’s four largest international tobacco companies, which control 90% of the Russian market. The Ministry of Health, which had drafted the law and was the main force behind it, said they expect the new rules to cut the number of deaths related to smoking in the country by half in the next 10 to 15 years. About 40% of Russians smoke – a total of 44 million people – with 400,000 people dying from related illnesses each year. “The implementation of the measures contained in the bill will reduce mortality from diseases associated with tobacco use by 150,000 to 200,000 people a year,” the ministry’s deputy director, Oleg Salagai, told Interfax. The law bans smoking in most public places, including government buildings, schools, hospitals, restaurants, train stations and near metro (subway) stops, from June 1. Also, cigarette advertising will be completely banned, shop owners will be barred from displaying tobacco products in store windows and graphic warning labels will be printed on packs of cigarettes. Russia is a key market for the world’s four largest tobacco companies. Analysts estimate that Japan Tobacco Inc. earns 11% of its global profit in Russia, followed by Philip Morris International Inc. with 9%,British American Tobacco with 8% and Imperial Tobacco Group with 5%. Britain is facing an energy shortage that will see household costs for heat and light rise by as much as 60 percent, according to one industry regulator. Alistair Buchanan, chief executive of Ofgem (the British government’s gas and electricity regulator) and the outgoing head of the regulator, did not put a number in a Telegraph report on just how high costs would climb for households, but he did indirectly indicate price increases of up to 60 percent. Gas prices rose by 60 percent in Japan, he said, and that country doesn’t even have its own supply source, The Telegraph reported. Mr. Buchanan also said that Britain will be forced to look to outside nations for energy sources in the next couple years. European Union pollution laws are forcing the United Kingdom to shut down coal plants, The Telegraph reports. And few alternative energy sources have been developed. Meanwhile, President Obama’s ongoing push against coal-fired plants (which has been used to generate 60% of U.S. electricity output) has led to substantial changes in America’s energy sector. The U.S. Energy Information Administration reported a huge drop in power sector coal consumption [due to government regulations], from 45 percent to 36 percent – and that was in mid-2012, according to Fox News. At the same time – and in line with what’s taken place in Britain – few other sources of energy have been constructed in the nation. b) What reason does the government give for controlling the haircuts citizens choose? b) Laws banning smoking in certain places have been implemented in many countries, as well as many states in the U.S. Proponents explain it is to protect/improve health. Why do you think governments/smoking opponents only work to ban smoking in certain places rather than making cigarettes illegal? c) Should smoking be outlawed? What do you think? b) Why does Mr. Buchanan expect heating and electric costs to increase so drastically?